The oldest and newest Indigenous materials in the APS Library: Domingo de Vico’s Theologica Indorum (written in K’iche’, 1553) and interviews by Holly Guise with Iñupiat World War II veterans, 2017. Used with permission. Archival collections can provide important insights into and a better understanding of societies, its peoples and cultures. Digital resources provide an opportunity for improved preservation and access, but also new challenges when it comes to who has access to this information, how the materials are categorized, used, and how to best safeguard indigenous rights associated with their content (including rights of privacy and dissemination). This is the challenge facing one Philadelphia-based institution in the United States, the American Philosophical Society (APS). With several hundred manuscript collections, photographs, and audio recordings related to over 650 different indigenous cultures of the Americas in its possession, the Center for Native American and Indigenous Research (CNAIR), founded in 2014 within the APS Library, has been looking for ways to take full advantage of technology to ensure that the 60+ indigenous communities and nations in North America with which CNAIR currently works reconnect with collections in innovative and collaborative ways. APS calls this approach Digital Knowledge Sharing. 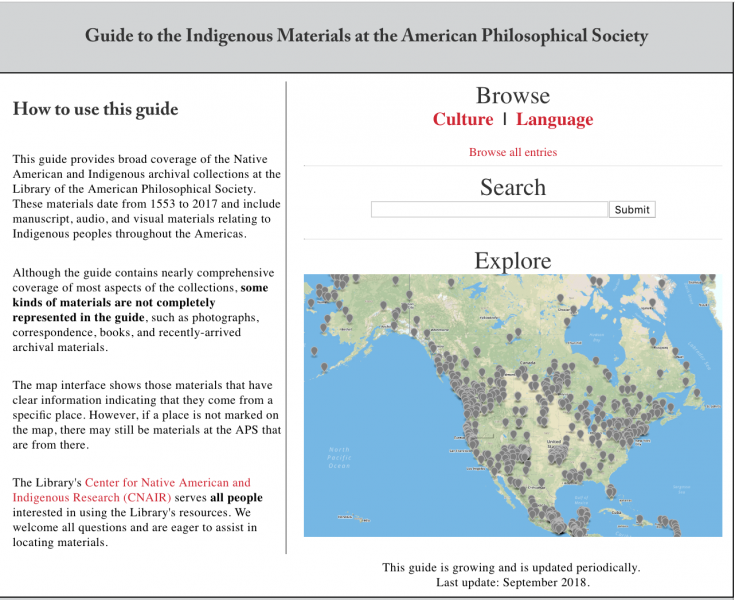 The Indigenous Subject Guide provides detailed coverage of the Native American and Indigenous archival collections at the APS Library. Screenshot of the map interface of the Indigenous Subject Guide. The project was completed in November 2017, and since then new information, corrections, and improvements have been added to it. Rising Voices spoke with Brian Carpenter, Curator of Native American Materials, about this new Guide. In relation to the historical background, Carpenter explained that the Guide spans several generations of archivists and librarians at the APS, starting with the first version published in 1965 as A Guide to Manuscripts Relating to the American Indian in the Library of the American Philosophical Society, put together by John Freeman who wrote thousands of entries describing materials relating to indigenous cultures and languages of the Americas. A couple decades later, the linguist Daythal Kendall added nearly a thousand new entries and published it in 1982 as a Supplement. In 2009, Michael Miller combined the content of these two resources and converted them into an online version, which enhanced their usability. Nonetheless, the content was incomplete and also flawed because it contained a large amount of obsolete, inaccurate, or pejorative terminology, and framed the materials solely in terms of their application to academic disciplines. Rising Voices (RV): The new resource includes a thorough overhaul of the methods by which the Indigenous-related collections are represented and described. Could you provide some details about these methods? Brian Carpenter (BC): One of the major changes in the new Guide is a wide-ranging update of the terminology used to name different Indigenous peoples. The previous Guide utilized many names for particular Indigenous peoples and cultures that are obsolete for a variety of reasons. In many cases, the name used in the past in English-language settings for a particular group originated from someone external to them, whether European colonists or a neighboring indigenous people, and was plainly pejorative or simply arbitrary and inaccurate. Some other terms that were in common use, such as “Kwakiutl,” refer to a particular prominent people that are part of a broader group (the Kwakwaka’wakw), but were used as a blanket term to denote that broader group as a whole. The new Guide uses the names in common, contemporary usage that also accord with how each culture refers to itself in an English language setting and gives those names prominence as the preferred terms. The entries in the Guide also include a list of alternate forms, in which there are both the obsolete names, as well as many alternate spellings that can exist for both the updated and obsolete names (for example, ‘Ojibwe’ is a preferred term used in the Guide, but many people also used ‘Ojibwa’ and ‘Ojibway’). We include these alternate forms so that if people come to the Guide and do a search using one of these other spellings or older terms, the information they are searching for will still come up, but they will also see what the preferred, contemporary term is—to the best of our understanding at the moment. This obviously will require continuous improvement, as I have no doubt that we are still missing many corrections along these lines for the 650+ cultural groups represented in the collections. Prompted by the completion of the new Guide, we are also integrating these updated terms into the finding aids for the collections, which are the full descriptions of the manuscript collections towards which the Guide’s entries direct researchers. In those finding aids, these obsolete terms can often appear in the titles or labels for the materials that were made by the original creators of the materials, such as anthropologists or historians. In such cases, we retain the term in the form in which they used it in order to correctly present the history of its use (or misuse), but then also add in the preferred term to provide researchers with information on the accurate contemporary usage. There are tens of thousands of places where these fixes are needed among hundreds of different finding aids for different collections, so tracking down all of them and amending them is an ongoing process in itself, as most of those can only be manually corrected one-by-one. This is one example of how principles that went into creating the Guide are transforming the way we represent the Indigenous collections more broadly. The other major change put into place in the new Guide is the more comprehensive inclusion of the names of the Indigenous individuals who played roles in the creation of the materials in the collections and whose expertise about their language, culture, and history is the very basis of the collections. In the past, where their names did appear, they typically did not show up in a prominent place, and their role typically was placed as secondary to the researcher who recorded their knowledge. In many other cases, the descriptions of materials did not reflect the names of the speakers, storytellers, singers, and others who communicated their knowledge, even when their names are present, documented, and easily apparent in the material itself. In creating the new Guide, we integrated into the entries thousands of names of this kind. This not only gives greater prominence to their roles, but also amounts to a different way of representing the materials in that it illuminates the fact that the materials within a given anthropologist’s or historian’s papers are often not primarily by that person. It also allows people to see the Indigenous experts who played roles—often the lead role—in the creation of the material as independent actors, rather than exclusively in reference to the researchers with whom they interacted. 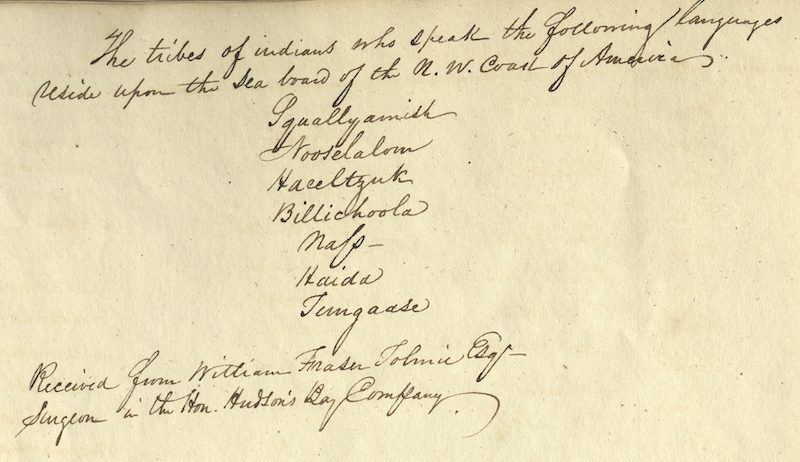 Detail from “Vocabularies of Squalyamish, Nooselalum, Haeeltzuk, Billichoola, Nass, Haida, and Tongaase,” circa 1834–1836, John Kirk Townsend Indian vocabularies collection. Used with permission. RV: In terms of the feedback during your collaboration with indigenous communities for this Guide, what would you say was some of the frequently sought information? BC: For most indigenous communities, maintaining and revitalizing their language is right at the top of the list of priorities, so any information on language documentation is highly sought. Even small amounts of language information found off to the side within a larger resource about something unrelated can be quite valuable. For example, one person told me that a note written in the margin on the inside cover of a field notebook from the 1920s that was otherwise predominantly in English gave a differently nuanced translation for a word they had been having trouble making sense of for a while. But now they have that insight thanks to that speaker explaining it all those decades ago and someone scribbling it into the margins. Most community researchers are able to zero in on the major, clearly identifiable sets of documentary material in the archival collections, but it’s these harder-to-find, lesser-known, and therefore potentially even richer bits of information that they’re eager to come across. This influences how we then describe the materials, both going forward and retroactively. For example, recently, in looking at a field notebook that one researcher was inquiring about that was labeled as being about one language, I saw that within it there was a small amount of info about two other related languages, so I then added that info to our cataloging information and to the Subject Guide so that researchers working on one of those languages can know that there’s some information there. It’s important to note also that sometimes information of this kind can be hidden in plain sight, such as in the original notebooks of language material that was eventually published, but within which there may be some portions that were not among what got published. Another major kind of information that communities emphasize the need for is place information. Knowing that a given set of material is about a particular language or particular Indigenous culture is one step in making things findable and usable, but in many cases having information in the cataloging description itself about which specific community it came from can be critical for communities in assessing the relevance and context of particular materials. An anthropologist might have classified a particular set of documents as relating to a particular broad cultural name, but one community associated with that name might see that the material was recorded at a different community, which might bear upon a range of different kinds of considerations depending on the specific context (such as who owns those stories under traditional protocols, or dialectical differences that language teachers want to clarify). Place information like this is another kind of information that is sometimes, but not always, present in the materials. RV: One of the emphasis in updating this collection is that “these important materials are represented in accurate, appropriate, and meaningful ways.” Could you provide some examples of how some materials from this collection are meaningful on a personal level? BC: I receive emails very regularly from people saying that they were doing an online search for the name of their grandparent and came across a recording by them, a photo of them, or a manuscript about them in our collection that they didn’t know about and want to know how they can obtain a copy. Getting it to the descendant in a meaningful way is also important. We try to find out how they would like to get a copy of it, which sometimes can mean doing a little bit extra, such as making a good-quality photo print and sending it in a frame, or making color facsimile copy of a set of manuscript and sending it in a nice binder so that an elder, for whom a big PDF file might be useless or too impersonal, can flip through it and use it in a way they’d like. In most of these instances, it’s likely that the person who found out about the item in this way had never heard of the American Philosophical Society before and quite understandably would not have thought to look for Indigenous archival materials at a place with a name like that. But the inclusion of that relative’s name in our cataloging made it possible for them to find it when they put it in a search engine. When people find materials that have these personal connections, it is not always just a matter of discovering unknown information. In many cases, the archival materials affirm knowledge already held in the community or in a family. For example, there might be a story or family history written down in a field notebook a century ago by an anthropologist who operated under the assumption that the knowledge would disappear, but the descendant reading that notebook for the first time will say, “Yep, that’s just how we still tell it,” and then proceed to also note various gaps and misconstrued details in the anthropologist’s analysis. I have witnessed this on many occasions. It is important to stress that this is not anomalous. 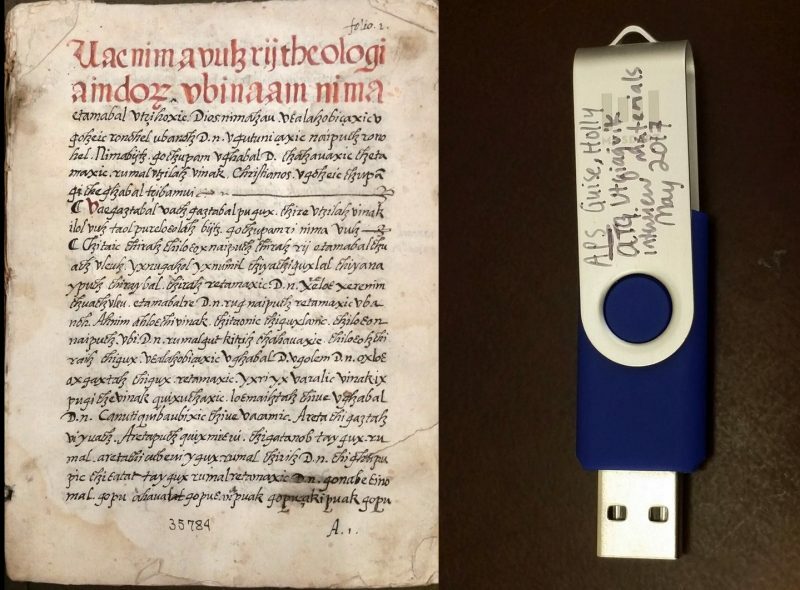 That encounter that descendants have with the archival materials is meaningful not just because of its personal connection, but also because that connection across time validates the continuity and persistence of that knowledge and heritage. RV: In what kind of additions and improvements have indigenous communities been most interested? BC: On a general level, communities are of course interested in updates to the Guide about new materials that come into APS that are related to them, as well as more detailed info about long-standing collections that offer up more granular details and illuminate the existence of less apparent information. 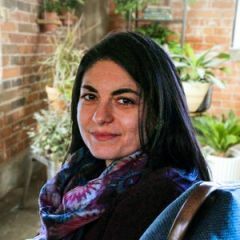 One research priority I hear from many communities is the desire to clarify interconnections among related archival collections that are spread across multiple archival repositories. For example, there are many cases where the APS collections contain manuscripts that directly transcribe audio recordings located at other archives, for which there are accompanying photographs at yet another archive. Given the prevalence of this research priority, we are considering ways of integrating information of that kind into finding aids for APS collections, and potentially into the Guide as well. The specific technical way of doing so is not clear at the moment–it's not purely a matter of having all of the information–though the Guide has a customized and flexible structure that would allow for new innovations, so I'm optimistic for its potential as a tool that would make it possible to try out new approaches to this widespread problem. Indigenous communities are more and more emphasizing this need in order to bring scattered resources together in the context of their own archives and thereby further exercise their expertise regarding their own heritage. That expertise can provide a corrective to aspects of the archival record that are inaccurate or misleading, as well as give fuller context to other aspects that, though recorded under the assumption that the knowledge would disappear, now serve as evidence of the continuity of these knowledge traditions. At the APS, these communities are our primary constituency of researchers, so our job as archivists is to figure out how to meet their needs. And as we've experienced many times over recent years, following the guidance and expertise of Indigenous communities is ultimately beneficial to the archive and to the broader research public. RV: Under what licenses do these materials exist, is it public domain or the APS owns this material? BC: The APS provides digital copies for personal, non-commercial use in private study, scholarship, or research. A Permission to Publish form must be submitted for requests to publish APS materials in any venue. The APS is currently developing licensing information to make these usage guidelines more explicit. Materials, whether digitized or not, are physically owned by the APS and may be in a variety of copyright states, from public domain materials to those for which the APS holds copyright, to those for which others hold copyright, of which some may be “orphaned” works. RV: Are there any protocols in place if a particular community asks for this material not be made available digitally or to the general public? BC: For materials not appropriate for general public research use, community authorities are able to contact us directly through the normal channel of reference email inquiries or phone calls. Most materials for which there are reproduction restrictions in place were first flagged by archivists here at the APS as potentially culturally sensitive, and therefore reproduction-restricted, pending further review by the appropriate authorities in the community in question. We then provide full digital copies of these materials to them and they provide guidance on what should or should not be restricted. Occasionally, they alert us to additional materials of concern that we had not initially flagged for review. These processes are outlined in the APS's Protocols for the Treatment of Indigenous Materials. Restrictions on the reproduction and publication of culturally sensitive or private information are a normal part of the APS Library's operations and currently pertain to about 1% of the Indigenous manuscript collections and about 10% of the Indigenous audio collections. Nearly all of the audio collections have been digitized. These are accessible in our online Digital Library on a collection-by-collection basis through a login and password. This allows us to regulate access to audio materials that are restricted. For manuscript and photograph materials, we do not place digitized versions of these online for public viewing in the first place unless we have made a direct assessment ahead of time of each specific item that it is, to the best of our knowledge, appropriate for that venue. We are developing a takedown form so that people can notify us in an expedited fashion if they have concerns about any directly viewable online materials.